We’d love your help. Let us know what’s wrong with this preview of Storm of the Century by Stephen King. To ask other readers questions about Storm of the Century, please sign up. Is this only available in the screenplay format? "I'm a little teapot short and stout, here is my handle, here is my spout, when I get all steamed up, then I shout, just tip me over and pour me out." Just an innocent little song? Not in this story! STORM OF THE CENTURY begins with an unspeakably violent death and the man responsible has not a care in the world.....save one. "Give me what I want and I will go away." The calm and collected Town Constable of Maine's Little Tall Island, Mike Anderson, is preparing for the Big One with half the town in his store clearing the shelves when news of a brutal murder reaches him....and the evil stranger, well....he's still at the scene......waiting. Now everyone knows the island has seen no murders since Dolores Claiborne took out her disgusting husband (never proven) years ago, so shock and fear has spread like wildfire. So......even worse than the approaching STORM with its hurricane force winds and arctic amounts of snow, the citizens are right to be wary for something else is coming to wreak havoc....something they've never seen before. How did I ever miss this one?? King hails it as one of his most frightening stories written for screen, and I so agree....oh what HE wants is so disturbing....and why pick this little town....bc bc bc...."Island folks know how to keep a secret." 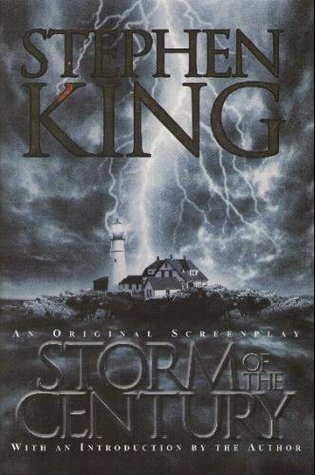 STORM OF THE CENTURY has now moved into my top 10 of 64 King stories read even though, this time, (for me) the screenplay format did disrupt the overall fear factor. (and I do love screenplays) As for the movie, it's long, but OMGOSH don't miss it! The sinister Andre Linoge played by Colm Feore is something to behold. 4+ Stars for the screenplay....5 Stars for the atmospheric creepy-scary horror of a story that kept me glued to the pages! I remember seeing Storm of the Century (the movie) back when it first came out and really, really loving it. I've seen it a few times since then, but I'd yet to read the screenplay, so I did. I have to say that I wasn't disappointed. I don't know if I would say that either one is better than the other... Each version brings something to the table. The movie version has creepy perfect Colm Feore, and while the book has stills from the movie, they just don't do him justice. And the movie has effec I remember seeing Storm of the Century (the movie) back when it first came out and really, really loving it. I've seen it a few times since then, but I'd yet to read the screenplay, so I did. I have to say that I wasn't disappointed. I don't know if I would say that either one is better than the other... Each version brings something to the table. The movie version has creepy perfect Colm Feore, and while the book has stills from the movie, they just don't do him justice. And the movie has effects and interpretation that King left open, and in this case, because he wrote it with that in mind, it adds to the whole rather than being one of those annoying detractions from the perfect-as-is text that movie adaptations usually are. But the book has little bits of King's personality shining right through it, and the sections of information and direction, which I "heard" in King's voice (OK, not his REAL voice, but the one that I hear in my head for him - is that weird, that I replace his voice with a made-up version?) are riddled with mentions of other works (Dolores Claiborne and The Shining, for instance) and humorous asides, etc. These lighten the mood, but make us feel like we're floating along watching the action from above while the clouds narrate. The book was definitely all King. His hands are all over this puppy. I don't know why I'm saying that like it's not obvious, but for some reason, I just felt like a screenplay would feel... different. It was like seeing everything in my head as the movie went along, which is quite possibly the point, although a lot of King's books read like movies. But this one felt different to me for another reason I'm just not really able to put my finger on. Maybe it was just the format - I'm so used to his novels and the personal feel of them that this felt like King dictating to someone else and that person writing the words in their odd and unfamiliar handwriting. Maybe I'm not making any sense at all. Could go either way. I mean, you can see King's touch here simply in the dialogue. One example is the way that the townspeople use each other's full names as casually as they'd use nicknames. It kind of gives it a realism/informal/formality that struck me as something that is as "Maine Islander" as saying "ayuh". But this is subtle, and probably lots of people find it annoying, but I loved it... it was like a little enhancement that tipped the scales from being cliched patois to actual speech. Moving on, I have to say that I really love the character of Andre Linoge - and no, NOT just because Colm Feore played him on TV - but because he is really, really creepy and sinister and... inevitable. He drops into these people's lives with no explanation and just starts wreaking havoc at every turn. He's horrible and cruel and evil, but he's also charming and funny and persuasive. And I will just say that I love the "Legion" reference. Legion is one of my favorite words and concepts, though that tidbit rarely makes it into everyday conversation, so when I see it I always get a little chill. The last thing that I'll mention here is how much this story reminded me of Pet Sematary. Both stories deal with the loss of a child, and both are very bleak stories without much hope of redemption, but they are also both compelling and great stories about the choices that must be made when there are no winning outcomes. Nothing good can come of anything, but you must do something, so what do you do? Excelentísimo libro. Un pueblo de la isla Little Tall en Maine, sufre una de las peores tormentas de su historia, la denominada "tormenta del siglo". Pero esto no será lo único que padecerán, sino algo peor está de camino, un ser misterioso y terrorífico que pondrá el pueblo de cabeza. Un libro fascinante que posee personajes increíbles, su narrativa me resultó ágil y que engancha desde el primer momento, quizá algunos se sientan confundidos ya que está escrito en formato de guion de televisión, Excelentísimo libro. Un pueblo de la isla Little Tall en Maine, sufre una de las peores tormentas de su historia, la denominada "tormenta del siglo". Pero esto no será lo único que padecerán, sino algo peor está de camino, un ser misterioso y terrorífico que pondrá el pueblo de cabeza. Un libro fascinante que posee personajes increíbles, su narrativa me resultó ágil y que engancha desde el primer momento, quizá algunos se sientan confundidos ya que está escrito en formato de guion de televisión, pero aseguro que se acostumbra muy rápido y se disfruta una lectura exquisita. Las historia es tan King..
Another very interesting, creepy, disturbing story by Mr Stephen King. I greatly enjoyed it, especially that it's written in an original style, different from the rest of his books. In the edition i read, Mr King explained how he got the idea of this book and that the more he thought of it, the more he saw it as a movie and that's why he wrote as a movie script. That's what caught me at the beginning. It was really interesting to picture the different scenes and characters, i mean i can usually pi Another very interesting, creepy, disturbing story by Mr Stephen King. I greatly enjoyed it, especially that it's written in an original style, different from the rest of his books. That's what caught me at the beginning. It was really interesting to picture the different scenes and characters, i mean i can usually picture in my head scenes when reading a book, but in this one the interesting thing was how the author made me Focus on certain details that i might have missed. With every scene; i can imagine from what angle to see it, if i had to focus on a specific character, and it was great! It made me live the story!! Now, the story itself was great!! The kind of story only Mr King can tell! Trapped on an island, during the worst storm "the storm of the century"; with a murderer from a different kind! He turned himself to the constable and yet the killings didn't stop. The residents start to panic when this man, Andre Linoge, starts to tell them their deepest and worst secrets!! Who is he?? how did he land on the island at such a time?? How did he know all those secrets?? and most important, what does he want?? The worst part starts when all he says is "Give me what i want and i'll go away"!! It was kinda hard reading in screenplay format. I've ordered the movie. I'd have liked it better written as a novel. "Родените в похот, станете на прах. Да дойдат при мене родените в грях." Dated genre for the most; modern rational thinking means devil stories are null and void. King's new direction works better for me. Although the screenplay format was at times rather awkward to read though, this is still a riveting story and probably some of King's better work. He disfrutado de este libro como no lo hacía hace mucho tiempo. Léanlo! "Бурята на века", ако сте пропуснали да разберете, не е типичният роман, а сценарий. Да - сценарий. Кинг сам пише във въведението си, че прекрасната идея за тази история му хрумва като роман за телевизията - сценарий. Затова той сяда и пише такъв. Сценарият веднага е екранизиран (1999 - Бурята на века - 3 серии по 91 минути) и филмът се води като най-добрата екранизация по Кинг (може би след Шоушенк). След големия успех на филма, Кинг решава да превърне сценария все пак в новела (роман) или казано по друг начин - да го издаде. Сценарий като роман! В началото мислех, че ще е трудно да се чете, защото пред всяка сцена има номер, описание, кой къде е, какво прави; кой говори; ремарки за режисьора и така нататък. Оказа се обаче, че така дори е по-интересно. Можеш да вникнеш в много неща и разбираш защо в даден филм има акцент тук или там, как е заложено да го има точно на дадено място и защо. Четеш сценария, който е роман, но кадрираш във въображението си подадените сцени. Освен всичко този роман може да служи и като учебник и пример за това как се пише сценарий. Ако някога ви се прииска да напишете такъв, разбира се. Горещо препоръчвам тази книга-роман-сценарии-учебник на всеки, който обича творчеството на Кинг и литературните експерименти. Забележката ми към издателите от ИБИС е дебелата хартия, на която е отпечатан романът. Все пак никой не обича да си купува хартия, както се казва в този бранш. It's all the weathercasters can talk about - the Storm of the Century. It'll be a blizzard, white-out conditions that will last for days. The tiny island community of Little Tall Island is ready. They've stocked up on provisions. They have the emergency shelter prepared. The islanders can take whatever the storm throws at them, ayuh. They have no way of knowing that evil is about to break through, an evil that will take and take, an evil that will change them all. As usual, King delivers a wonderful thriller. From the start, you know things aren't going to go well for Little Tall. But how bad will it be? Will they fight back? Will evil overcome? That's the genius of King! The reader never can guess what he's going to do. Happy ending? Tragedy? Toss the coin, Mr. King! I was riveted until the end, guessing and wondering how things would turn out. Quotes: p.366 : "some wounds can never be cleaned out." p.371:"... this is a cash-and-carry world, pay as you go." the story is about island folks from the place called Little Tall. they get snowed in when an old lady gets murdered and the killer gets locked up. but from behind locked bars the man possesses everyone who has some dirty little secret. and its said thorough multiple times that island folks can keep their secret between themselves really well. the people who are too stubborn to confe Quotes: p.366 : "some wounds can never be cleaned out." "Un libro diferente a lo que estamos acostumbrados, pues realmente es un guión de televisión, que nos narra como los habitantes de una isla se ven aislados por una tormenta y encima deben hacer frente a la aparición de un hombre misterioso que amenaza las vidas de todos ellos. Con una estructura que hace un poco confusa la lectura al principio, el relato va atrapando al lector y mostrando los estragos que pueden causar ciertos sucesos en las actitudes de la gente y como quien menos te lo esperas "Un libro diferente a lo que estamos acostumbrados, pues realmente es un guión de televisión, que nos narra como los habitantes de una isla se ven aislados por una tormenta y encima deben hacer frente a la aparición de un hombre misterioso que amenaza las vidas de todos ellos. Con una estructura que hace un poco confusa la lectura al principio, el relato va atrapando al lector y mostrando los estragos que pueden causar ciertos sucesos en las actitudes de la gente y como quien menos te lo esperas, esconde secretos que no imaginas. El final hace reflexionar sobre hasta donde se puede estar dispuesto a llegar con tal de sobrevivir...". No sé por qué me hice esto. No suelo leer guiones, pero de algún modo me ayudó a engancharme el hecho de que el ritmo sea tan rápido. Otra cosa es que esta historia se pasa de malvadilla, como por el último cuarto estaba que quería morirme por lo que veía venir. No lean esto si quieren ser felices. Wow... definitivamente King lo escribío que final, muy bueeeeeeno! Excelente narración, sólo le juega en contra la forma de.guión en que está planteado. Omitiendo eso e imaginándose la historia como novela, excelente. "La vita sulle isole è diversa. Quando ce ne bisogno, noi facciamo squadra. E sappiamo mantenere un segreto quando è necessario. Ne abbiamo serbati in quantità nel 1989. E la gente dell’isola li conserva ancora". Non è un romanzo vero e proprio ma è soltanto la sceneggiatura dell'omonima mini serie TV. Dopo le prime paginette ti abitui alla strana forma di scrittura e non ci pensi più (diventa anche più facile ricostruire le scene e lo scorrere narrativo). Purtroppo, però, la storia non è per nien "La vita sulle isole è diversa. Quando ce ne bisogno, noi facciamo squadra. E sappiamo mantenere un segreto quando è necessario. Ne abbiamo serbati in quantità nel 1989. E la gente dell’isola li conserva ancora". Purtroppo, però, la storia non è per niente originale (e da Stephen King chi se lo sarebbe mai aspettato? ): in una comunità standardizzata (in cui tutti nascondono dei segreti più o meno gravi) ed isolata dal maltempo, arriva un demone a reclamare "qualcosa" in cambio della salvezza dell'intera comunità. La trama de "La tempesta del secolo" è tutta qui... e, per giunta, manca anche il lieto fine! Da segnalare che la location del romanzo è la stessa di "Dolores Claiborne" (in un paio di passaggi vengono anche citati sia lei che l'omicidio del marito da lei compiuto) e che, in alcuni punti, il malvagio Linoge mi ha ricordato moltissimo il Randall Flagg della saga della "Torre Nera" e di altri romanzi di King. No me esperaba ese final, guardé hasta el último momentos las esperanzas, la batalla, una caída de máscara... Y no. Me devastó. Me encantó el formato película. Pude visualizar cada plano y cada escena a la perfección. "Дайте ми това, което искам, и ще ви оставя на мира." Чудесно беше отново да се срещна с Линож, този път в сценария. Още по-хубавото е, че бях забравила някои подробности от историята. Но въпреки че помнех почти всичко, пак бях на тръни в напрегнатите моменти. A pesar de ser un guión, algo que no acostumbro leer y menos de manos de King, me resultó una lectura muy llevadera. i thought that it was an amazing book!!!!! I loved this, I just think it would have been so much better as a novel! I started this book last night, which was perfect timing: A storm was coming in and the wind outside was insane. Just like in this screenplay. The story takes place in February 1989 on Little Tall Island off the coast of (you got it) Maine. The Storm of the Century is threatening to roll through, and with it comes a stranger to the area, Andre Linoge. He's creeptastic in the way that most of King's villains are; but there's not a whole lot new here. Small community feels the strain of outside forces, a threat to their livelihood and their families. The stranger knows these people inside and out and uses this knowledge to his advantage. He is persuasive, to say the least. It took a while for me (I would say the entirety of the first Act) to get used to the screenplay format. It's like reading a play, sorta, which is fine normally, but not at all how I expect to read Stephen King. But after a while it did kinda work, and like I already said the weather outside was perfect for it. I woke up this morning to snow on the ground and more coming down and I thought for a moment this could be Pittsburgh's Storm of the Century. But the snow stopped by the time I got home from walking the pug, and it wasn't even as slippy as it was when I left a little while earlier. And I remembered that this really is Pittsburgh and the only Storm of the Century that occurs here is when the Baltimore Ravens are in town against the Steelers. I always appreciate reading King, even if his stories don't bedazzle me every time, or even if they're so similar that even I have to scoff at times; but reading him is always sort of like coming home for me. It probably has to do with the fact that King has been a part of my life since forever - some of my earliest memories involve looking at some of his early books on my mom's bookshelf. I started reading him at a relatively young age and he's just always been there. He's a comfort read for me. I don't necessarily expect a lot from him, outside of simple amusement and entertainment, the promise of being taken somewhere else for a little while, and even the occasional thrill. I'm a dork for his characters, and continue to love when they enter different books. (This story includes more than one reference to Dolores Claiborne and at least one shout-out to Danny Torrance from The Shining.) All of his characters seem to be a part of the same small community, and I totally dig that. It's the most fucked up community ever, and it's not exactly one I would like to be a part of myself. But it's familiar, and the people are pretty real, and I find myself coming back time and again to see what they're up to now. Note: The ABC mini-series, Storm of the Century, is coming up pretty soon in my Netflix queue, so I'll be back soon to add my review of that here. Tim Daly? Yes, please. (03/11/12): Last night I finished watching the TV miniseries for which Stephen King wrote the screenplay. It was decent enough, but the part I kept conveniently forgetting was that the book really is the screenplay. So the miniseries followed verbatim what I had just read a couple weeks ago in the book. Both were fine, but nothing much to write home about.